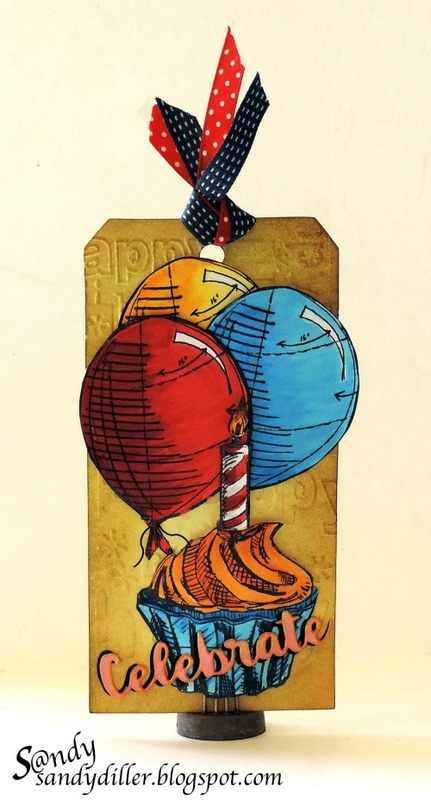 Welcome to the fifth Friday in April and on these five Friday months we all enjoy a special post where anything goes as long as it is a tag and the Creative Guides have gone all out in their creativity and inspiration and provided an incredible line up. So let's get off and take a look. 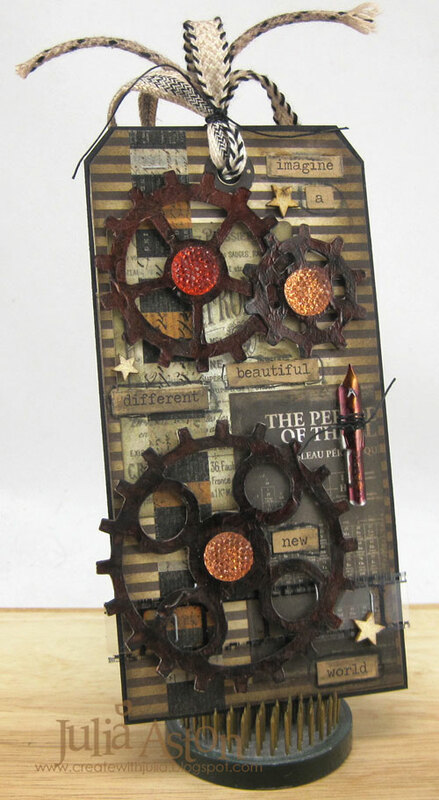 I took the opportunity of today's AVJ April Tag Friday to use my new Gadget Gears #2 die and to try out a rusting technique on them! For more details and photos - I invite you to stop by my blog post here! I do love a Tag Friday! and the chance to experiment. I decided to dig out some tea bag fabric sent to me by a textiles friend and which I have had for ages, wondering what to do with it. 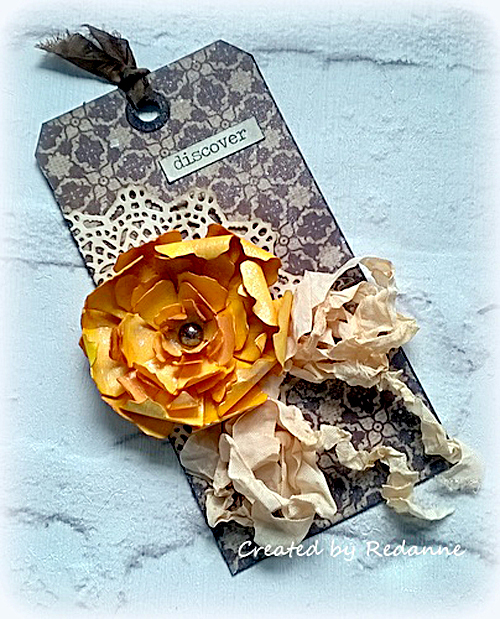 I decided to use it to encapsulate elements on my tag and then to add a 3D flower cluster on top. I am quite pleased with the ethereal look to the tag which really only needed small cluster to set it off. There are a few more details on my blog if you would like to see more. 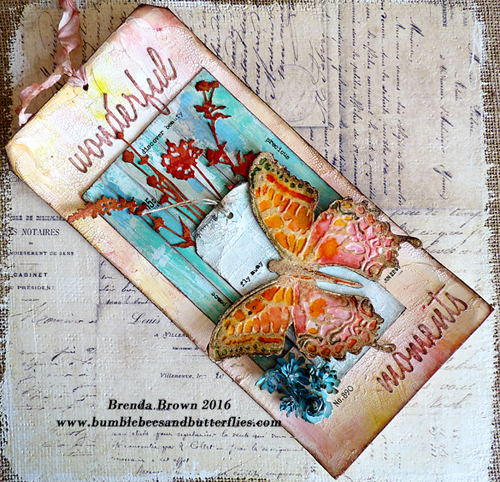 I used lots of bright vibrant colors along with a vintage background to create my tag. We have lots of birthday celebrations coming up next month around our house so wanted to get a head start. Hope you will visit me at My "Crafty" Life on the Internet for more details. I've been working in the garden and the arrival of the butterflies and moths now that Spring is here inspired my tag for this month's Tag Friday. I also just got some new to me embossing powders so decided to give them a test drive, stop on by my blog to see some step by step photos. perhaps they were intended. You can see more on my blog here. 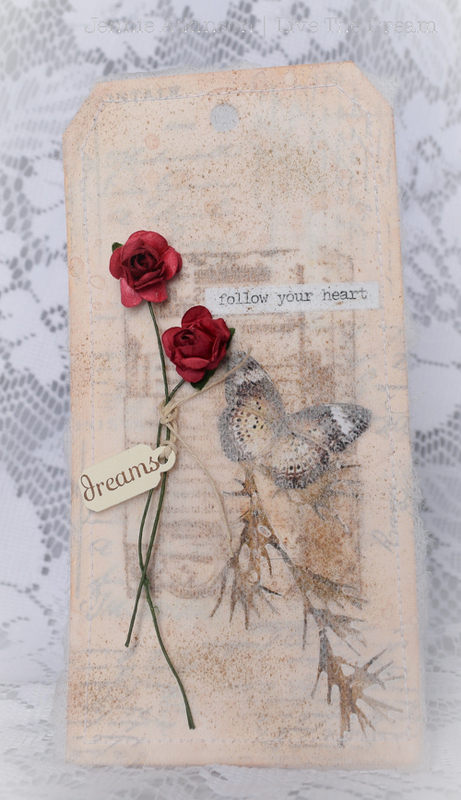 I took this Tag Friday opportunity to have a play with Tim Holtz New Distress crayons. 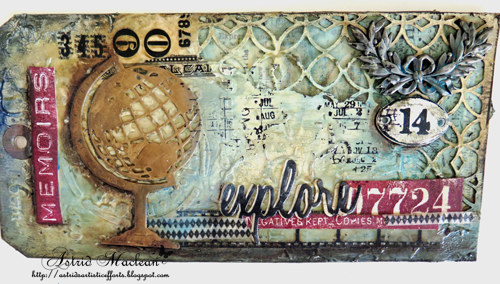 If you would like to see how I used them there are more details on my blog. Having been on holiday to Lanzarote and finding some beautiful hot weather I think my mood and mind is still set with the warmth of the sun and I am sure I have been influenced by the hues of the sea too. 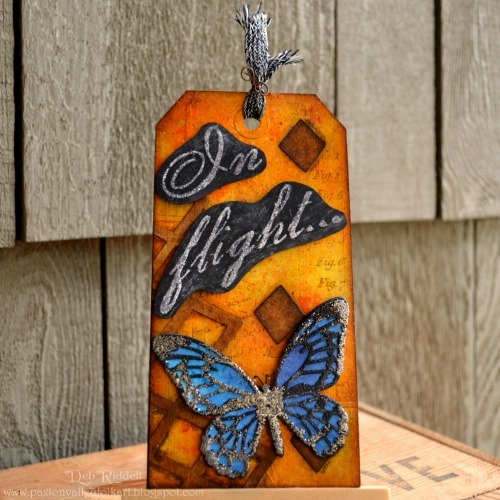 I have to admit the butterfly was left over from a workshop session but I love the colours and didn't want to waste it and the same with the weathered board which reminded of the boardwalk and marina in Playa Blanca. Roll on summer here in the UK. Well I hope you have enjoyed the very varied line up of inspiration from the Creative Guides, we look forward to seeing you again on Monday when we have a fifth Destination Inspiration post for the month. Between now and then have a fabulous weekend. A wonderful gallery of tags! Looking forward to popping by your blogs and seeing/ reading how these beauties were created ! All of these tags are uniquely beautiful. Great artwork. Wonderful inspirational tags from everyone. Wonderful tags from everyone, I really enjoyed my trip around them all earlier today! Fabulous tags - I've just had a lovely time hopping round - always uplifting and inspiring. I thoroughly enjoyed my visit here today, and have come away refreshed and inspired! 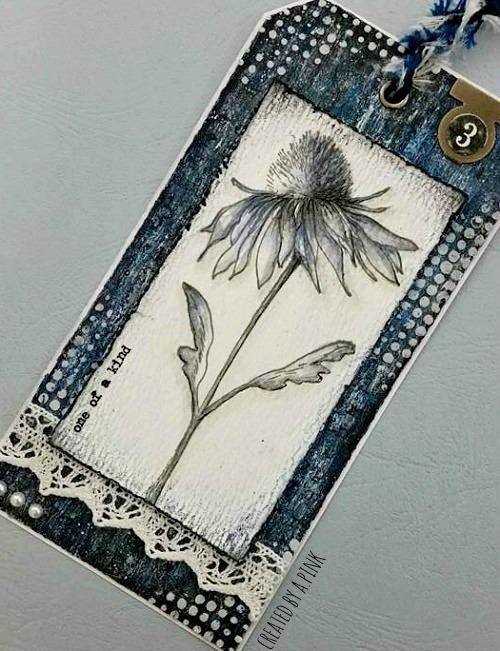 Beautiful and a diverse line up of mixed media tags! Hopefully my computer will comply today and allow me to hop around to see each one of these up close! Hugs!